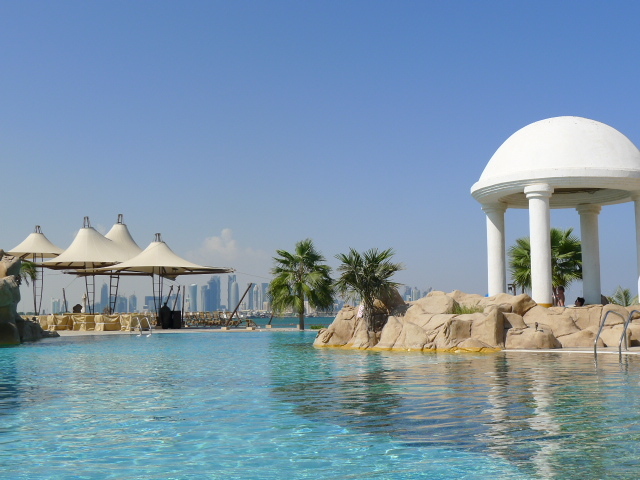 After a couple of hours of chillaxing by the pool I headed to the Six Senses Spa to savour one of their spa treatments. 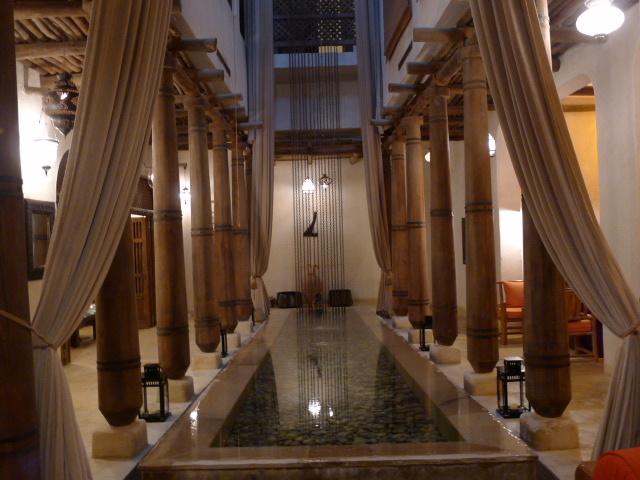 In keeping with the style of the hotel, the spa area is also beautifully decorated in a traditional Qatari theme. 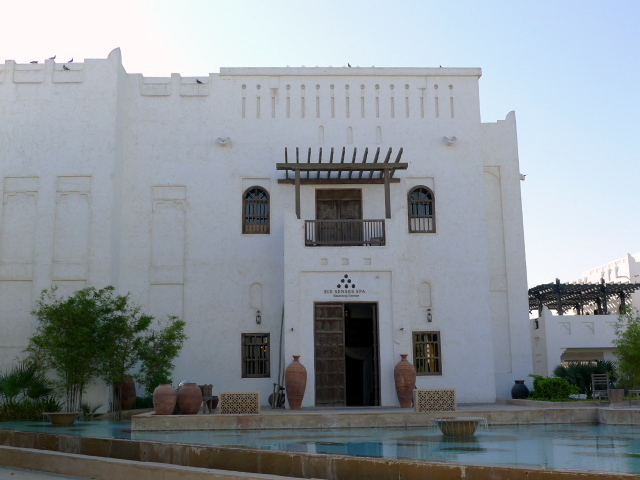 Its design consists of ‘village’ laneways rather than corridors that flow together to create a greater sense of harmony, and the treatment rooms resemble typical Qatari village houses to heighten the sense of comfort and homeliness. I tried the de-stress massage (QR480 – about £82), a heady and soothing 50 minutes of luxurious pampering, after which I spent time using some of the other spa facilities such as the hot tub and the sauna. 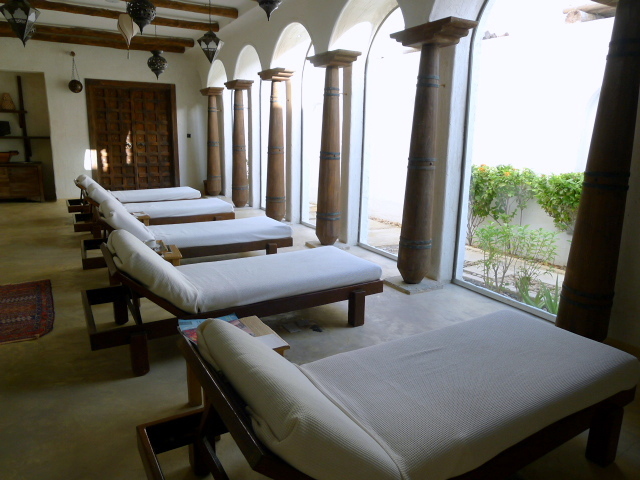 The Six Senses Spa also plays host to a couple of breakout relaxation areas which have been lovingly designed. Both the pool area and the spa made for a lovely afternoon retreat, although the hotel’s location, a five minute drive from the airport means that you occasionally get noise from the aircraft flying overhead. 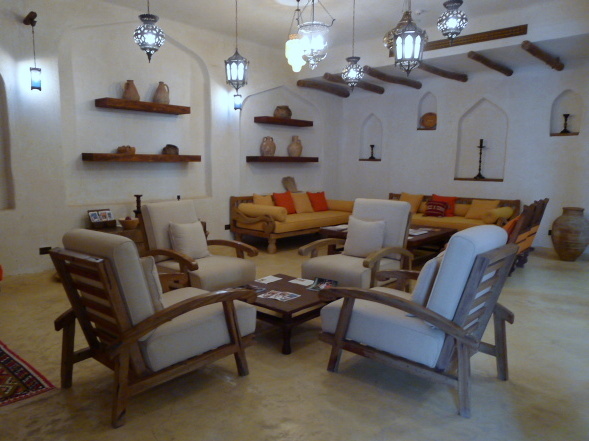 For something to eat afterwards, I headed to the Al Jalsa Restaurant at The Sharq to try their afternoon teas. 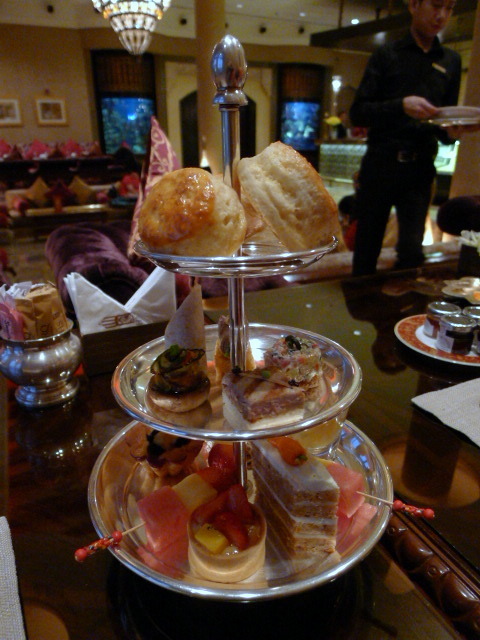 There were two types of afternoon teas, a Healthy and a Royal afternoon tea (both QR135, about £23). Each consisted of a different selection of canapés, scones and pastries, with the healthier options in the Healthy Afternoon Tea being a pineapple yoghurt and a granola bar. The canapés were really good for both originality and flavour. The selection included the likes of grilled tuna with wasabi and ginger pickles, brie with fig chutney, quail egg salad topped with caviar, marinated shrimp and smoked salmon with cream cheese. Particularly enjoyable were the grilled vegetable and the tasty beef tenderloin with asparagus and mustard canapés. Scones were agreeable although they were a little dry in parts and slightly inconsistent in texture. The clotted cream promised with the Royal tea was also quite dense, a little too thick and not quite creamy enough in taste. The pastry selection, containing about 5 items per afternoon tea, was solid with the carrot cake and chocolate ganache being fairly tasty. The lemon tart showed particularly skill with an excellent pastry case and a wonderfully zingy lemony filling. The chocolate tart was also decent, although the pineapple yoghurt didn’t quite work amongst a range of desserts which were sweeter and richer. Afternoon tea was quite a nice way to spend an hour as part of a day already at the beautiful Sharq Village & Spa, especially as the Al Jalsa Restaurant is so nicely decorated. The canapés were more fanciful then simple sandwiches but the scones didn’t quite hit the spot. And unlike British afternoon teas, there didn’t seem to be an opportunity for seconds. But you needn’t go for afternoon tea. Al Jalsa serves cakes by the slice and coffees as well. Afternoon tea is priced at QR135, about £23.